Leftover ham recipe and post-Easter brunch idea. 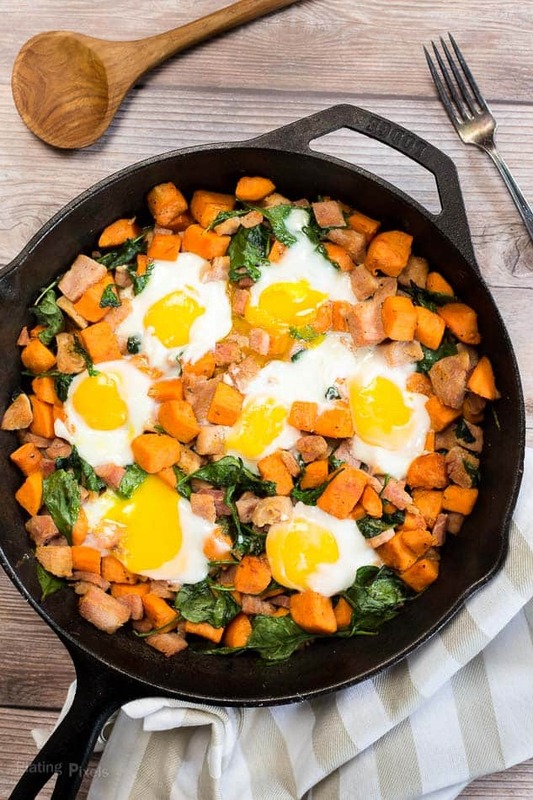 Spinach and Ham Sweet Potato Hash topped with pasteurized over-easy eggs, baked in a skillet. You look in the fridge and see a large container of leftover bone-in ham plus extra sweet potatoes you tried to fit into the pan, but somehow that five pound bag doesn’t always fit. 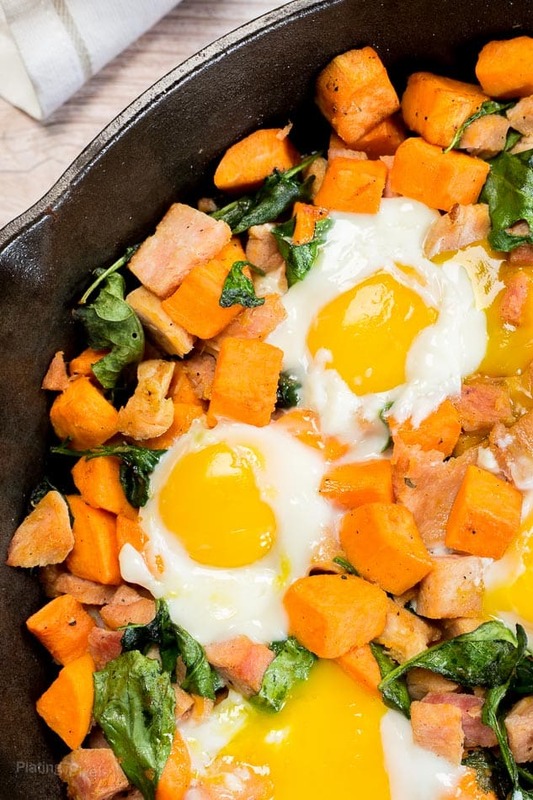 Naturally you should make Spinach and Ham Sweet Potato Hash. All you need is a few more ingredients, including lots of eggs, for a hearty Easter themed brunch recipe. Ham and eggs are quintessential Easter ingredients, this recipe combines them together into a filling, hearty and unique Easter leftovers brunch recipe. 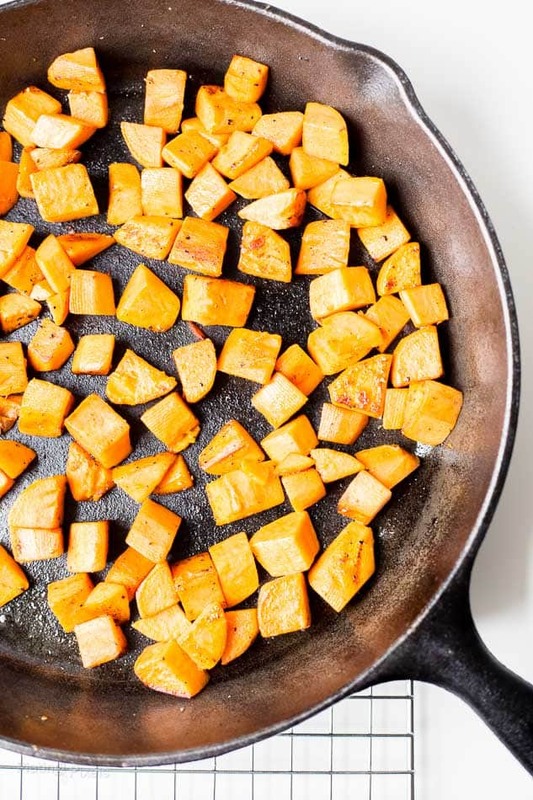 Preheat oven to 425° F. Peel and cut sweet potatoes into ½-inch cubes. Heat oil in a skillet to medium-high heat and add potatoes, salt, pepper and cumin. Cook 10-15 minutes, stirring often, until browned and just tender. Stir in ham pieces and spinach. Cook 3 minutes more until spinach wilts. Remove from heat. Carefully break eggs over top, spaced evenly apart. Place skillet in oven and cook about 10 minutes, until egg whites set. Yolks will be slightly runny, cook more or less depending on how over-easy you prefer eggs. Yum! This looks so healthy and perfect for brunch, or even dinner. I especially love all that fresh spinach! Love this! We had a similar hash (albeit it with regular potatoes) for St Patricks Day! This looks like a fun twist on that recipe! What a great way to transform leftovers into a legit next-day meal! Great combination of flavours for a quick and easy weeknight dinner. Great use of the leftover holiday ham!! Perfect for those holidays with plenty of ham. Thanks Gloria! They’re awesome right?! Thanks Sue! This is perfect for today! I was thinking about hash with all of my Easter leftovers. I’m so glad you shared this. Well that works out perfect then! Thanks Andrea!